Participating in Tuesday's call were Apple Chief Executive Tim Cook, Chief Financial Officer Peter Oppenheimer, and Corporate Comptroller Luca Maestri. Cook started off the call by declaring "Apple's business is stronger than ever." Apple completed 15 strategic acquisitions in the last year. On cash returns to investors: Cook said Apple plans to be "thoughtful and deliberate." Cook teased that Apple sees growth opportunities in current markets as well as new ones. Over 14,000 employees at Johnson Controls are using iPhones for work. Apple sees the iPhone 4S as its entry offer and a way to enter the ecosystem. Cook said there is "elasticity in that market," and his company plans to "move accordingly." Year over year sales growth in Japan, Russia and the Middle East. Apple also saw strong back-to-school demand in the U.S. and Canada. In the U.S., "large iPad initiatives" have been rolled out. Coachella County School District and a South Carolina district were both singled out by Oppenheimer. Apple isn't focused on unit share, though the company sees the overall tablet market as "huge." 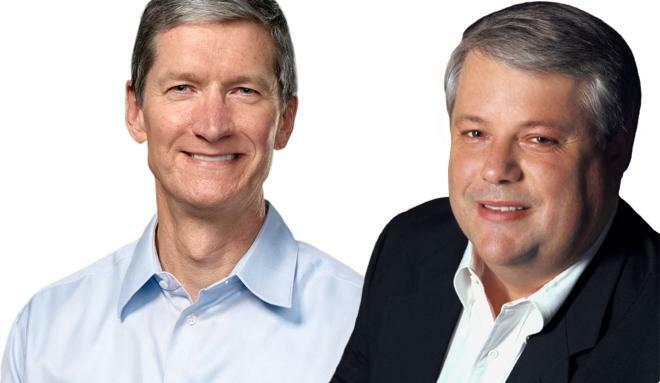 Cook is "confident" Apple will grow its sales year over year. "I think it's going to be an iPad Christmas," Cook said. Apple has a 94% share of tablets in education, a number Cook said is "unheard of"
iPad mini with Retina display will ship later in November. "It's unclear whether we will have enough for the quarter or not. We know how many we will have, but you really don't know the demand until you start shipping." iTunes software and services reached $4.4 billion in the quarter, a 22% year over year increase. With an average of 411 stores in the quarter, average revenue was $10.9 million per store.